We strongly urge Councillor Perks to read our post on bicycle helmets and join the discussion/debate over there. Foam hats do not save your head from 2-ton vehicles travelling at 30-50 MPH–let alone the rest of your body. What a joke..a cyclist dies of a pierced lung or crushed heart and the “journalist” writes, “cyclist wasn’t wearing a helmet”. Helmet legislation and insistence on them is a subtle part of a strategy that aims to make cycling look like a dangerous, extreme, or in the best light, athletic activity that requires protective gear. Under this mindset, it can and should never be mainstream, safe, rational, or simple. I guess Perks won’t bother responding to those who point out greater dangers with other forms of transport. At least he confirmed yet again why I haven’t bothered to vote NDP. 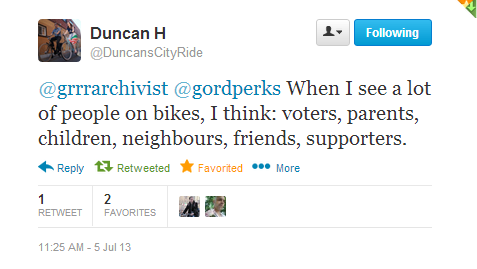 Layton family aside, I find too many in that party share Perks views on cycling (or at least cyclists). Ryan, he didn’t answer my comment either, and as James knows, I was speaking from several decades’ experience of urban, everyday cycling activism, with safety for pedestrians, cyclists and other life forms a priority. That loser! If this leads to talk of a helmet law like the BS one we had in BC, my protest against it will be suggesting that drivers have to wear helmets too. See how they feel about being told to strap one on. 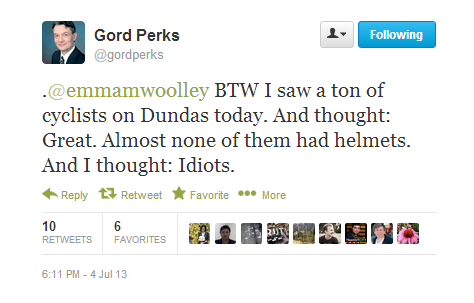 Councillor Gord Perks just lost a ton of support. and what exactly are drivers of cars? In the past two days, the horror on the lakeshore (complete driver error, New Jersey man charged), a 73 year old pedestrian struck and killed in Scarborough; a young man dead in Newmarket after being struck by a taxi. And they worry about bikes. and continents, we tend to came upon many incomplete antique churches.